Wilde Farm was built in 1907 by Samuel Wilde, a successful coffee and spice trader. Wilde Farm began as a horse farm with a Colonial Revival styled farmhouse. About 1994, the current owners took over custody of Wilde Farm. The winery specializes in small quantities of wines from old vines and exceptional vineyards. The winemaker is Pax Mahle. Fermentations are driven by ambient yeasts, oak is neutral and fermentations proceed at their own pace. Stems are included sometimes. The wines are bottled unfined and unfiltered. 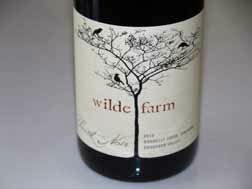 Wine critic Antonio Galloni called Wilde Farm "one of the most exciting new projects I have tasted in the last few years." In 2012, two Pinot Noirs were offered: Trois Fils Anderson Valley and Donnelly Creek Vineyard Anderson Valley.